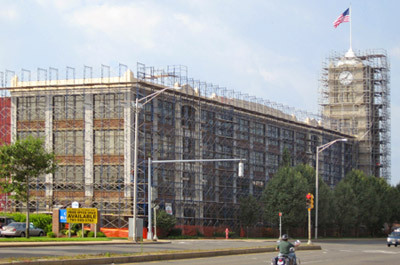 We offer a huge inventory of scaffolding equipment and related construction products. From steel frame scaffolding to the latest Hydro mobile powered mast climbing work platforms, we have what you need, ready to deliver to your worksite. Contact us with any questions. We will be happy to serve you. 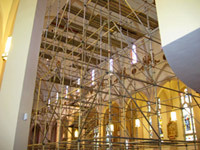 We have many scaffold frame styles to choose from. Vanguard's 5-foot wide frames are ideally suited for maintenance and general applications. They are available in various heights plus a 6'4" "Walk-Thru" model. We carry frame widths, including 24", 30", 42", 4', and 5' wide, and 2', 3', 4', 5', and 6' tall, in heavy-duty and light-duty. A 7'6" tall pedestrian walkway frame is also available. Not all widths are available in all heights. Please contact us for specifications.